There are advantages to having broad shoulders and being a solidly-built Yorkshireman, as Phil has discovered now that he's the daddy to not one, but two little kiddies. Nina, despite weighing well over 10kgs, still loves riding on Daddy's shoulders (and why wouldn't you, when the view is so good! 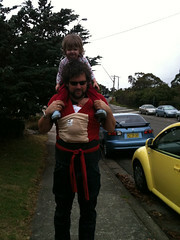 ), and now Pascal is discovering the benefits of a broad warm chest, courtesy of our hug-a-bub sling.